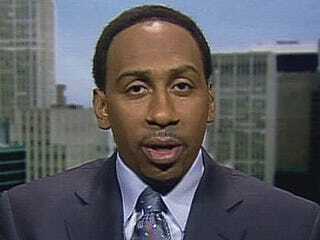 The print comeback of Stephen A. Smith has derailed again, as his brief return to the Philadelphia Inquirer as a columinzer is now finished. Mutually. Respectfully. Quite frankly. Statements and farewells from all parties involved after the jump. "Stephen made a major contribution to The Inquirer during his 15-1/2 years at the newspaper, and we wish him well in his future work." "I'd sincerely like to take a moment to thank the Philadelphia Inquirer for 15 1/2 mostly wonderful years," Smith said. "I can honestly say I would not be where I am today, nor would I have been able to achieve the things I achieved, had it not been for the wonderful opportunity granted to me back in 1994. "But all things must come to an end. At some point, it's necessary to move on and explore new, adventurous opportunities, which is precisely what I'm doing and I'm incredibly excited about. "Still, I'd like to acknowledge the tremendous level of gratitude I feel for the opportunity afforded to me. I wish the paper well for the future, as I'm certain they will do for me."